Northumbria in Bloom Award 2015. 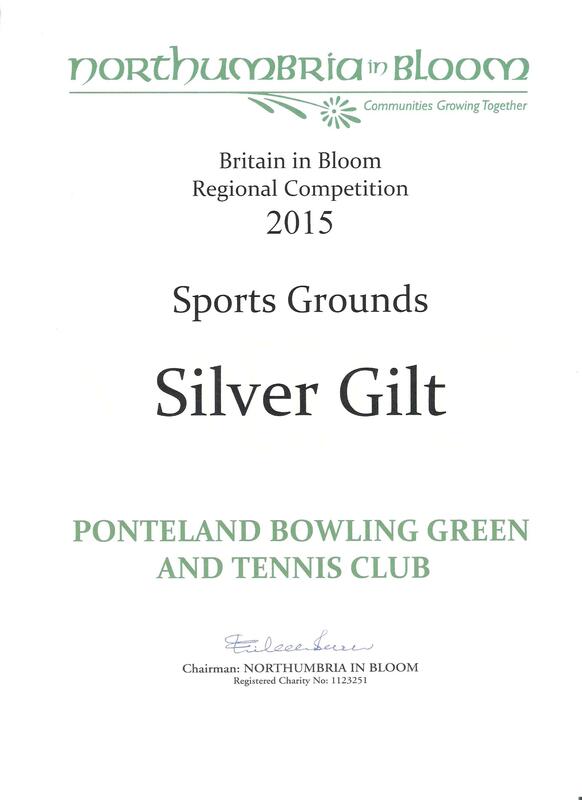 The bowls club grounds, combined with those of the tennis club, were awarded the Silver Award for 2015. The 2015 Ladies 2 wood county championship was played at Morpeth (St Georges) on Thursday 27th August 2015. Congratulations to Pam Varley, from Ponteland, who successfully overcame a strong challenge from Mary McNally, from Amble, in an excellent final. Presentations were made by Rae Brown from Amble. Congratulations to Gloria, Mary and Allison who won The Northumberland county final of the Benevolent Triples Trophy. The semifinals and final were played at Amble on Monday 20th July 2015. The Ponteland trio of Gloria Stapylton, Mary Robinson and Allison Storey beat a team from Burradon in the semifinals and then Alnwick in the final.